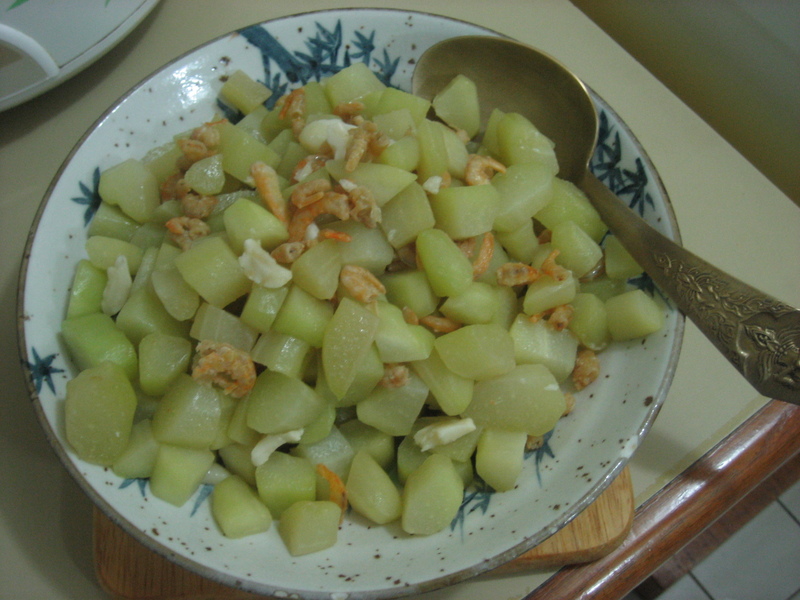 I would like to share 2 other recipes using Chayote or "Chouchou"! Wash clean the dried shrimps. Soak them in cold water for 10 minutes. Drain and rinse. Heat oil over medium heat and stir-fry the garlic until tender; then add chayote. Cook chayote, stirring occasionally until crisp-tender (5-8 minutes). Add shrimps. Simmer until chayote is tender. Wash pork bones clean and scald in boiling water for 5 minutes. Rinse and drain. Peel carrot and chayote and cut into large pieces. Wash corn, carrot and chayote. Bring water to a boil in pan; put pork bones (or lean pork), carrot, dates, corn, and chayote in pan and when it boils again lower temperature; simmer for 1 hour. Add kernels. Lower heat and simmer for another hour. I usually use lean pork (shank) instead of pork bones as it is less fatty.